Ring Repair London and Ring restoring. 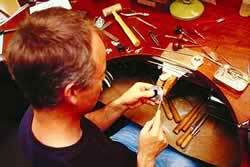 Antique ring repairs London. Breathe new life into your old rings or damaged rings with our ring repair service and fast turn around ring adjustments. Ring repairs London. Diamond ring repair London Hatton Garden. Broken ring repairs. 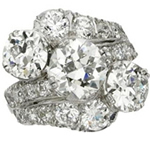 We can restore and fix a worn ring, repair a broken ring, restore and repair an antique ring or vintage ring repair. Antique Ring repairs London. We have been specialist ring repairers Hatton Garden London since 1875. Does your engagement ring need repairing. Does you wedding ring, signet ting, eternity ring or any other ring need to be repaired? Have you noticed a small diamond missing from your engagement ring? Our jewellery experts can help by replacing missing stones, ring sizing and repairing damaged claws and ring shanks. Engagement ring repair. We can adjust your ring. Our goldsmiths can size a ring up or size a ring down, making the ring bigger or smaller to fit. We are specialists at sourcing and replacing missing gem gstones and diamonds. Our workshop have facilities for stone setting diamonds, gemstones, semi-precious stones that have fallen out. Replace missing claws retipping claws, re-solder claws. The prongs holding a stone can get worn. Our service is to replace missing claws, strengthen old claws and retip claws or prongs to protect the stone. Ring band repair, shank repair – If the shank has been damaged, broken, bent out of shape or worn we can reshape the ring, restore the band or replace the shank. We offer a Speedy ring repair service, ring fixing & ring re-sizing service. Specialist Vintage ring repair & specialist Antique ring restoration. Fast Ring sizing London, Ring repair Ring remounting. Victorian ring repair. Broken ring repair. Antique ring repair London Hatton Garden. 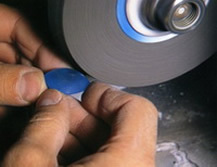 Repairs to Second-hand Gold rings. Fixing rings. Mending rings, Diamond ring repair. 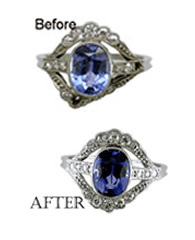 Precious stone rings repair. Engagement Ring repair and ring restoration. Vintage Gold Ring repairs. Platinum ring repairs. Antique ring repair. Palladium ring repair. Ring refurbishment, shank replacing. Ring shanks renewed. Antique silver ring repair replacing worn shank, repairing bent or broken shanks. Wedding band repair and ring adjustment. Ring soldering repair. Urgent ring repairs. The Ring Shank is the band around ring. This can be damaged and worn and may need to be replaced. Shanks supplied and remade in all sizes and profiles such as “D” Shape, Flat Band and Court shape. The shanks can be supplied in White gold, Yellow gold and Rose gold 9ct Gold (375), pink gold,18ct Gold (18K) 750, 22ct. Silver, Palladium and Platinum bands too. Ring Retipping - when a diamond or gemstone is set in a ring with a claw above the stone and the claw has worn and the claw needs replaced. Claw re-tipping, worn settings replaced. Worn bands remade. Missing claws remade, claws strengthened, claw re tipping, claw wearing, claw replacement, retipping claws re-tipping prongs. Retipping gold claws, retip platinum claws, retip silver claws. We improve dull rings, mend rings, overhaul rings, align wonky shanks, correct faulty claws, improve your rings appearance, mend settings and claws, overhaul your ring, re-adjust bent claws and prongs and rectify worn shanks and bands. Renovate worn settings; tighten claws and correction of bent shanks. Re-rhodium white gold rings white gold plating, rhodium, re-plating, white gold dipping, replating white gold. Total ring enhancement, improvement, mending, adjusting and modification if necessary. Our Master Jewellers and Goldsmiths are talented craftsmen.They have many years of specialized experience, to assess the needed ring repairs. 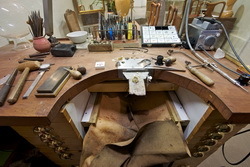 Our Goldsmiths have spent many hours refurbishing rings and repairing beautiful rings from the past, working in one of the finest jewellery workshops Hatton Garden London. We use the latest jewellery laser welding technology for ring laser repairs to offer a high quality repair combining modern technology with traditional craftsmanship. The alternative method to repairing delicate rings is Laser welding. This does not require removing gemstones or other heat affected materials. Quiick ring sizing London. This is perfect for broken claws and general ring repairs. 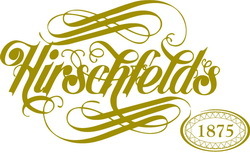 We have a dedicated laser jewellery goldsmith using the "state-of-the-art" laser precision welding technology. Using this latest laser fusion method we can join or fuse Platinum, Gold, 22ct gold, 18ct gold, 750, 15ct, 14ct, 585, 9ct, 375, Pink gold, Rose gold, Silver, Palladium and other metals. The laser's concentrated heat is perfect for delicate repairs without risking further damage to fragile antique rings and antique jewellery.The laser welder is a technological advancement that uses a sharply focused beam of light to produce very high heat in a small area. Lasers allow us to accomplish ring repairs that would once have been either impossible or too time consuming to be worthwhile. We use state-of-the-art micro laser welders, precision soldering and specialist electro-plating techniques to ensure your repaired spectacles look as good as possible. If you need your ring repairing or your ring restoring but you do not have time to take your ring to your local jewellers or if you do do not live locally, you can post your ring to our London jewellery repair centre any ring that needs refurbishing or renovating. We tackle many ring repair jobs that other jewellers will not attempt to rescue or rejuvenate. So If you think that your ring cannot be mended or repaired - Try us for a free estimate, while you wait. How much? How long? Immediate estimates, repair costs and time lines. Or download this post repair form for ring repair by post. Ring examination. We offer a complimentary ring checking service to all our customers. Please feel free to pop into our workshop and offices should you be passing, to have your ring examined and checked over for any potential problems. 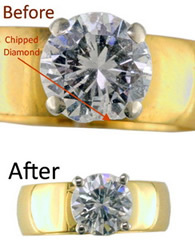 If you wish to know how we can repair your ring, please contact us for details for a fast, free estimate. Or visit us for a while you wait ring repair estimate. 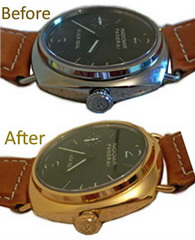 London Ring repairs to all London Neighbourhoods and covering all the UK.